Never mind the tepid move in U.S. equity benchmarks this month, there’s been plenty going on below the surface. 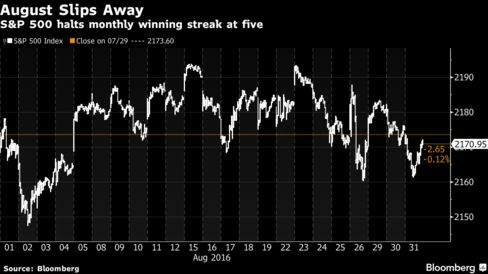 At first glance it’s been a month of anemic trading, marked by the lowest daily volume in almost two years, while the S&P 500 Index failed to budge more than 1 percent in either direction for a 38th day. But that tranquility belies a more significant shift in sentiment, where investors are once again embracing stocks that benefit from a stronger economy even as they prepare for a interest-rate increase as soon as next month. The S&P 500 wiped out gains for August on Wednesday as energy producers dropped with crude oil. The gauge fell 0.2 percent to 2,170.95 as of 4 p.m. in New York, halting the longest monthly winning streak in two years. The Dow Jones Industrial Average lost 53.42 points, or 0.3 percent, to 18,400.88. About 6.8 billion shares traded hands on U.S. exchanges, in line with the three-month average. As confidence in the economy built, comments from Federal Reserve policy makers at last week’s symposium in Jackson Hole, Wyoming helped solidify a risk-on mentality, Green said. That’s because an increased probability of rising rates makes high-dividend defensive industries less attractive. Prices for Fed funds futures imply a 61 percent chance of a rate hike by year-end, up from 36 percent at the start of the month, according to data compiled by Bloomberg. Utilities stocks tumbled 6.1 percent in August, the biggest monthly decline in more than a year, while phone companies slipped 5.7 percent, their worst since 2014. Technology and financial shares both rose for a second month, adding at least 1.8 percent, with banks capping their best performance since February. Compared with a wild August in 2015 when the main U.S. benchmark tumbled 6.3 percent, this year’s late-summer season was calm. The lightest day of the year, this past Monday, saw less than 5 billion shares traded, while daily average volume fell 8 percent this month from July. Meanwhile, subdued price swings typify a market that lacks commitment either way, Green said. “People are sitting and waiting to get a little more clarity,” he added. The CBOE Volatility Index waited until August’s final week to surge to it biggest monthly jump in a year, though it remains more than 30 percent below its 10-year average. After reaching a record on Aug. 15, the S&P 500 has failed to maintain its momentum amid lukewarm economic reports and speculation over the timing of the next Fed rate increase. Equities have wobbled this week, with investors sharpening their focus on the August employment report as its outcome has the potential to cement policy makers’ decisions on borrowing costs at the central bank’s meeting in three weeks. Sri-Kumar points to second-quarter gross domestic product that grew less than previously estimated, along with the five-quarter recession in corporate profits as evidence the economy isn’t strong enough to sustain another rate increase. Rather, he says the next move by the Fed could be a rate cut or another round of quantitative easing. Commodity shares led a retreat Wednesday amid a report showing crude stockpiles rose more than predicted. Energy companies trimmed their August advance to 0.6 percent from 4 percent two weeks ago. Chevron Corp. sank 1.1 percent, while copper miner Freeport-McMoRan Inc. posted its worst month since May. Among shares moving on corporate news, H&R Block Inc. tumbled the most since April after reporting a wider-than-estimated quarterly loss. Apparel retailer Chico’s FAS Inc. jumped 12 percent near a four-month high on better-than-forecast quarterly results. Hi! My name is Inna. I turned $10k into $3 millions in a few years of trading. I am here to share my success and help you to become financialy free. You are welcome to my website!